Event Tracking Or Social Tracking Or Both? With so many different social media buttons and boxes and plugins, deciding which ones to include on your site can be overwhelming. And it’s even more daunting to track your visitors’ interactions with those buttons, especially if the data ends up scattered across multiple reports. Google Analytics’ new Social reports, populated with data using the new _trackSocial method, raise the question: When should you use event tracking and when should you use social tracking? You might be influenced by the fact that Google +1s are automatically captured in the Social reports. So why not just use _trackSocial for everything instead of _trackEvent or some combination of both? Let’s look at some of the differences. GA’s user interface distinguishes the two methods, _trackSocial and _trackEvent, by placing the resulting reports in separate sections. Event reports reside in the Content section alongside Pages and Site Search, while Social reports live in the Visitors section along with reports for Demographics and Behavior. Before we look at that framework, I want to discuss what counts as “social interaction.” The _trackSocial method was introduced as a way to track social plugins, but I think it could be applied to other social media buttons as well. The documentation includes only examples for specific types of clicks – where the social media platform actually confirms a successful like or tweet or +1. But visitors may click on other types of buttons, such as “connect with us” icons that are nothing more than external links. They take the visitor to your Facebook page or your Twitter page, for example, where she may or may not click the Like button or the Follow button. The Social reports identify visits by two Social Types – a visit is either from a visitor who is “Socially Engaged” or not. So you could decide that only successful likes or tweets or +1s truly indicate a visitor is Socially Engaged, and only use _trackSocial for those types of clicks. In contrast, a visitor who clicks the link to go to your Facebook page might be less engaged. The problem is that once the visitor leaves your site, information about what happens next – such as whether she clicks Like or not – is beyond the reach of Google Analytics. GA can only record that she clicked the button to go to Facebook (or any other social media page you may have). Consequently you could decide to exclude these clicks from the “Socially Engaged” data in Social reports, and instead use _trackEvent to populate that data in Event reports. I’m inclined to count clicks on all social media buttons, boxes, and plugins as “social interactions” and try to put them all in the new Social reports, but you may have a different view. And I’m still experimenting to see what works for me. While you can build a good framework with event tracking, less granular than with social tracking but still pretty close, ultimately the edge goes to social tracking for its combination of granularity and flexibility. Obviously, the event framework has less granularity since one event slot (Label) has to cover two social slots (Entity and Page). You can search by event label to view data for entities or pages – it’s just a little more work than using Social reports where it’s already broken out for you. Another disadvantage of this particular event framework is that all the categories for social events, like Facebook and Twitter, are mixed together with categories for other events you might track, like downloads and video plays. On the other hand, the Social reports separate them quite nicely. 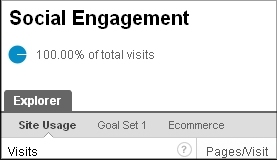 Perhaps most significantly, Event reports come with data for site usage and ecommerce, but do not contain goal data. Social reports have tabs for all three. That means more flexibility for analysis right out of the box. Click on that Goal Set tab and see right away how well your Socially Engaged visitors converted across different goals, and which types of engagement correlated with more or fewer conversions. Sounds good, right? Not so fast. There’s one potentially major drawback to consider. Whether you choose event tracking or social tracking, all types of buttons can be tracked. I’m definitely leaning toward covering everything with _trackSocial. I’ll cover the details of my experiments in a follow-up post. What’s your approach for tracking social interactions in Google Analytics? Which features are influencing your decisions? Please share in the comments.